The new owners of the former Frank’s Steakhouse have revealed some details of the tenants they have lined up for their redevelopment on Freret Street — including a yogurt shop, a wine bar, a juice bar and professional offices — as nearby residents begin discussing the impact of the new apartments planned for the site. The first-floor commercial space planned for the Freret Street side of the development is now 70 percent leased, said developer Arnold Kirschman said at a recent meeting with neighbors. While it is too early for him to begin naming individual business names and owners, one will be a wine bar that serves some food, he said. The yogurt shop will be the only chain businesss, though it will be owned by a local franchisee, Kirschman said. There will also be a juice bar, Kirschman said, and a number of local professional services that are not food related. He said he and his wife, Rachel, are excited about the lineup so far. “We’re dying to tell you,” he said. Freret residents have largely welcomed Kirschman’s purchase of the property — which lay unused for years — and supported his request to demolish much of it, while saving the old laundry building. The upper floors of the buildings will have two floors of apartment units. 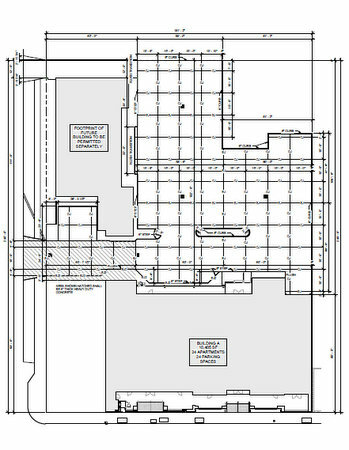 One element of the Kirschmans’ plan, however — a new apartment building to replace two shotgun doubles on the Cadiz Street side of the property — drew a number of questions during the Thursday afternoon meeting at the Publiq House, directly across from the new development. The Kirschmans said that their original intent was to move the old shotguns, but their condition is too far deteriorated to salvage — termite inspectors even refused to go under the houses. They have looked in vain for other solutions, they said, such as donating them to anyone who wants to move them, but so far have found no takers. They need the additional residential density on Cadiz Street, they said, to help financially support the relatively low, three-story frontage on Freret. With the increased density, many residents are worried about the traffic and parking, said Kellie Grengs of Freret Street. Juan Winsey, who lives directly across Cadiz Street from the proposed building, said he expects college students sharing apartments to increase the volume of traffic even more. The Kirschmans said they already own residential units all over the city, and they have very low turnover at their properties — college students, Arnold Kirschman said, are “not our target audience.” Further, the the spaces they have provided on the interior of the property exceed the amount required by the city. “We put parking on the interior of the property because we thought it would alleviate traffic on Freret for the businesses,” said Rachel Kirschman. Greg Ensslen, who has redeveloped a number of Freret properties himself, applauded many of the Kirschmans’ design choices, saying he would even be fine with less parking as more in keeping with a less car-oriented future for the city. But more broadly speaking, he said, the project’s number of apartment units may be too much for Freret. Michelle Ingram of Zeus’ Place, also directly across Cadiz Street, asked the Kirschmans to explore fewer, larger residential units inside the property that will appeal to more families rather than individual renters. “I think you are going bigger than what our neighborhood can support,” Ingram said. While she couldn’t promise any individual changes, Rachel Kirschman said those considerations were the reason they wanted to meet with neighbors. Amy Batiste, the CEO of Neighborhood Housing Services, asked the Kirschmans what they plan to charge in rent. High rent, she said, is likely to have the most significant effect on the neighborhood, by driving prices up nearby and pushing long-time residents out. Those prices have not yet been set, the Kirschmans said. The Kirschmans hope to begin pile driving on the property in early May, and anticipate about 10 months of construction, they said. If all goes smoothly, they hope to open the property some time in early 2016. Juice bar: We already have one down the street. 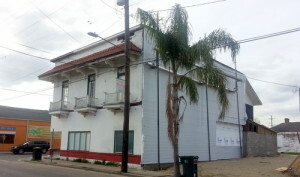 Part of the New Freret revival from the start. Yogurt chain: Already had a go at this a few years back, spectacular failure. Already have an ice cream shop right around the corner. Wine bar: Not for me, but beats another yoga studio. The Kirschman’s have already penciled out what the rent needs to be in order for their investment to pay off – that’s the question that should have been asked. The rent’s are going to be eventually what the market will bear – not what the CEO of Neighborhood Housing Services wishes – affordable rentals for low to middle class – too bad. As for commercial: yogurt, wine bar, juice bar – how organic… and boring. Why don’t you take it upon yourself to open a more exciting commercial spot? Also, I’m sure the Kirschmans would be thrilled if you subsidized rent for lower income folks too! We all do – with Section 8 housing. I’ve said it before and I’ll say it again…Freret needs a grocery. A close copy of the Zara’s on Prytania and Upperline would be perfect. Why is all the new development architecture so goddam lifeless? It’s as if the architecture schools are teaching suburban Phoenix as the ideal to be striven for. Agreed. These developers are certainly credited for attempting to save and restore the existing buildings. But they lose credibility in their attempt to replace the torn down buildings with a nod to Veteran Blvd style.